Book now for a fun mountain stay in the breathtakingly beautiful mountains of Graham County . where the majority of the area is National Forest and will never be developed . Where the mountain tops seems to touch the sky in many areas. The location is the best kept secret of them all. Seeing is believing!. Rushing mountain waterway is in the front yard not across, down or in some other property. It is right there in your face. This home is very private with acreage and has a long drive way coming into property. . Walk out and wet your hook if you so desire or your big toe. App. 1200 ft. of private trout fishing. Hike to your legs content. Explore the whole area. Then another waterway about 2 blocks down and all that into Lake Santeetlah. When you need a relaxing reprieve we have satellite TV and Roku Steaming Smart TV where there are you can watch Netflix and UTube, or over 2000 channels. You can also visit Harrahs Casino in Cherokee, and Harrah's Valley River Casino in Murphy, visit Cherokee Indian Reservation and many gift shops and vista points. Visit Fontana Dam and see Lake Santeetlah, Joyce Kilmer Memorial Forest, near the cabin, vistas from the Cherohala Skyway, white water raft, see Cades Cove in the Smoky Mountain National Park, and/or Dollywood. All these and more are at your beckon call and or just lay out by the old trout stream with that good novel, and or write that novel. Bring your ATV and go riding, or hike to your heart's content. Just enjoy nature at it's best. Motor Bikers welcome!. Come ride the 'Dragon' @ Deals Gap and the Cherohala Skyway. Other beautiful rides are near. . This cabin can sleep 1 to 5 people depending on your group mix. Sleeping alcove with bed, plus fold out queen sleeper sofa, plus roll out and pack in play. Open floor plan with alcove , separate bath, laundry, pantry, closet. Come see, smell and relax and you will surely return soon..
Email today by clicking through and we will be glad to discuss your pending visit. 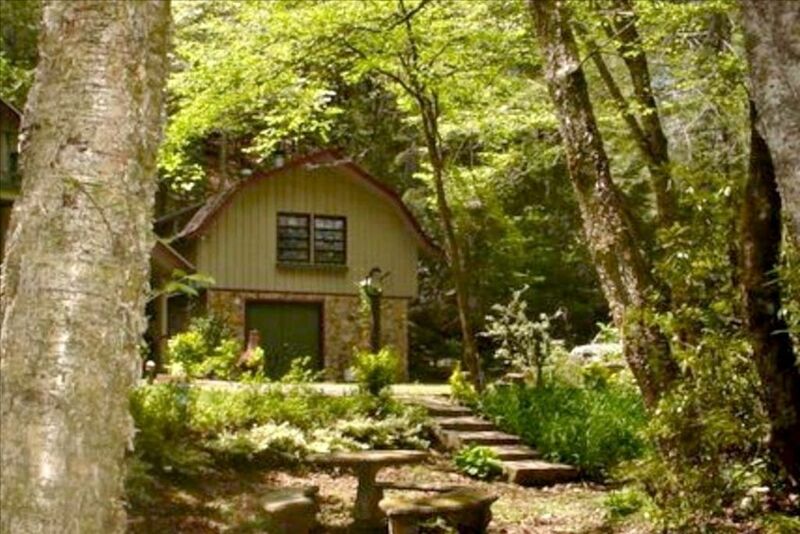 Keywords: Cabin, at waters edge with Trout waters in front yard, waterfall and landscaped pond., near 2 Casinos, Romantic getaway, family reunion, church groups, wedding guests, Stress free zone. .
We built the place so as to have a hideway from the hectic life we lead in the big city. Requirements were: water in your face, views, huge mountains, snow in the winter, wildflowers in spring/summer, animals, sweet smelling fir trees, stars and fireflies to name a few. We finally found this place after 8 years of searching. But we had to start building/finishing off the property. But what fun it was. Having visited the Blue Ridge and Smoky Mtns. for years, we knew exactly what we wanted in a property. Good access was another criteria. We purchased this property for the beauty around us and the quaint natural beauty of these mountains. We especially wanted the 'rushing water' factor and were so lucky to have found it in the front yard. After purchasing and cleaning out the area of brush across the river/low and behold we found this beautiful waterfall. What an additon! Listen you will hear it all. Another waterfall is up the driveway. Relax!. We had to have easy access and a 4 season property. Nature truly abounds here. We wanted a place to fish after having beat the crowds in other states. So here it is. We purchased it immediately. We are so very fortunate. We also wanted property so we could have family reunions. With this cabin and Vrbo# 32603 & a log cabin across /down the road Vrbo #708691 we had plenty of space to have everyone (friends & family) to come and meet us here. What fun we have had and so glad we chose this route and this place. Look forward to your visit very soon..
Privacy galore yet things to do all around you. Want to do nothing, then just bring that book and enjoy peace and quiet at this property. Or better yet, write that novel and or screen play as we have had at least one guest do. Take a cup of coffee out and watch the dog play in the big yard. Our Min Pin Lucy enjoys the mountains too. We love to ride the ATV, hike , swim, eat outdoors, sit around the fire pit and tell stories, Bring the grands and show them the wildflowers and teach them about nature. Hike, hike, hike for goodness sake. Easy access was a must for us and we have it here. Smell the fresh air? We have traveled a lot and know what we like. We try to supply that and maybe more, we hope, for our wonderful guests. When they return, we know we have done our part. We like to fish, play in the water, play with our dog and grands, ride the ATV-Mule, check on the wildflowers, have coffee out side and picnic take the hammock out and swing by the waterway. Oh yes, did I say sleep? We love to do that in the hammock. Ride up the Cherohala Skyway and enjoy the wild azaleas, sled down the skyway in winter when cars are not out, go to the Casino and have dinner in Cherokee, eat at the various restaurants, hike Joyce Kilmer Memorial Forest, rent a pontoon and cruise Lake Santeetlah, visit waterfalls and make tons of pictures, but most of all, we just enjoy staying at the property and hanging out. What a way to relax from our busy lives. Come see & do and then tell me what you found that I have not. I am always looking for adventure. on acreage with great access. Small ski run down the mountain into the yard. Great for sledding as well. Large mountain river/creek flows right out your window about 20 ft. from the cabin in the front yard. Hear it? Also, another larger river is about 1 1/2 blocks down and then Lake Santeelah 3 to 4 miles down. FREE LD service for our guests for USA. Bring your cell to use as you travel. yes, Central and back up heat on walls, plus wood burning fireplace. all furnished that you will need for your stay at our property. washer and dryer in the laundry room. Enclosed room off the open concept area. Only bring your towels if you have an approved 4 legged friend for the doggie paws. yes and those with motor bikes are welcome to put them under cover. We have FREE WIFI and am told we are only one in our neighborhood with WIFI. Made available with much work with the provider. Not a dish either that looses signals. bring your table, laptop and or smartphone and you are good to go. Bring it. You can use it down the road. Use landline inside cabin if your cell does not work. We have 550 ft. of driveway plus parking pads and garage. ask and we can tell you how/where to park. yes, we will leave you wood. USA calls are free to our guests. some spices are always there but bring your most important ones.You may use what we have in cabin. All that you will need to make a wonderful meal. have table and 4 chairs, plus bistro on the covered porch for 2.
yes HDTV and ROKU the steaming service with Netflix plus about 1000 channels. Direct TV awaits your visit. Come enjoy and play your guitar while relaxing on the covered porch. Also bistro table there and 2 chairs, plus rocker. we offer DISCOUNTS for 60 years and older. Read our ad please. Not an adult community but you are welcome with a special price. free calls in USA - local and or long distance phone service. plus free WIFI> You may bring your laptop, tablets, smartphone and have, plenty of roaming room, great access, bring your ATV and ride, Motor bikers welcome and can enjoy area all around us, enjoy nature at it's best with great wildflowers and landscaping. Easy access to property and for hiking as well. FISH< fish, fish. Plenty of that in front yard and 2 blocks down another river plus Lake Santeetlah ,, plus world known Snowbird Creek and others. Our stay at the cabin was great and exceed expectations. There was enough to keep younger kids busy the entire day playing in the water and exploring nature. Although the weather was rain off and on it was nearly undetectable by the beauty of the surroundings and the relaxing calm refreshing sounds of the stream outside of the main window. We will plan to return in the future. Thanks for coming and we will try to order up no rain for your next visit. Come again!. Tranquil stay on the creek! My family and I loved our stay. It was so peaceful. We slept with the windows open to the sound of the running water from the creek. Loved every minute of it!!! !There was so much to see in the Robbinsville area. We drove through the tail of the dragon on our way to Dollywood, went to Cheaoh Dam, Fontana dam, went to a local farm where we picked apples and some vegetables. It’s was very nice know that after a long day of running around we could relax to a nice fire and the sounds of nature. Would definitely stay again! We loved the stream being so close and in the evening we were able to sit on the bench and watch the firefly's chasing each other around - it was very relaxing. The stream sings to you all night long if you leave the windows open. The only negative is the access - a single lane gravel road and with just enough parking for two vehicles. People should know not to bring a boat & trailer - there is no space for them. We ended up storing our boat at the ranger station near the boat ramp. Overall - it was a very nice weekend and we loved the cabin by the stream and enjoyed Lake Santeetlah with the boat once we figured out where to store it at night. Description of property was misleading. Pond was no more than a goldfish pond. No rushing waterway and picture of house with tree on left hides house next door. House was musty smelling and apparently hadn't been used in a while. Kitchen sink and coffee pot were in desperate need of cleaning. Won't return. Excuses, well what can I say. I held back $75. of her $200 deposit because she broke house rules and did not take off the garbage as per instructions given in her email about housekeeping and flood lights left on when they left, , as per housekeeping rules posted inside cabin and email to her. Cabin floor was filthy but I would not have knock that, within reason. However; housekeeping rules broken, we cannot tolerate. House reeked of garbage as she had left it in for 3 days and then put one huge bag outside in the garbage can as she was leaving which you could smell as you walked up on the porch. . We had to go in open windows and air the place out and use vinegar to dilute the smell of garbage. Her excuse is she cannot take garbage off in her car as she does not have a pick up truck per her private email to us. . Bikers take their garbage off on the bike Wenda. Figure that one out! We have a landscape trout pond and it is not for trout fishing. You go to a pay pond for trout fishing. The water is always rushing and it depends on rain/branches feeding in and right now we need more rain in July. So sorry you want your full refund back. I told my family I was "running away from home", at THAT I did. :) Although I am a single female, I care for, and tend to other family members. I needed to relax and recharge and this was a very nice, quiet, beautiful and serene area to do just that. It is very secluded, so be SURE to read the owners directions carefully, as GPS does not work in mtns. I stayed in the smaller cabin and it met ALL my needs. The only reason I gave 4, instead of 5 stars is because some things are just a bit "dated". All in all, I enjoyed my stay and thoroughly enjoyed exploring the creek and the outdoors. Also, the owner, Ms. Robinson was sooo very nice, informative, helpful, courteous and quick to respond to my messages/questions. Thank you! or just relax. Trout fishing and lake fishing for cold water fish. Bring your novel and or write your novel here, or JUST RALAX and hear the water and birds sing. The area is made of mainly of National Forest enabling us to enjoy much quiet times. Animals love it too. pet fee: $35.00 per pet, max 2 dogs --35# or less in crate, current on shots, de-flea. additional: per person fee is $3..00 per person per day over 2 people, max of 4--depends on mix of group Cleaning is included in rental totals.